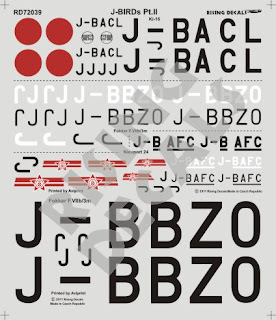 Continuing their very welcome tradition of designing decal sets of Japanese subjects in series grouped by topic Rising Decals have issued a new trio of 1/72nd scale sheets covering a diverse and very colourful selection of JAAF subjects. Rising Decals 72036 Emperor's Eagles Pt. III provides markings for 11 Burma and Indo-China based Ki-43 and Ki-44 fighters. Three 50th Sentai examples have been selected, two early Ki-43-I models flown by the 2nd Chutai's Sgt Chikashi Kotanigawa and the Sentai commander Maj Tadashi Ishikawa and a Ki-43-II flown by 2nd Chutai leader Capt Masao Miyamaru in a brown and green 'kumogata' scheme. 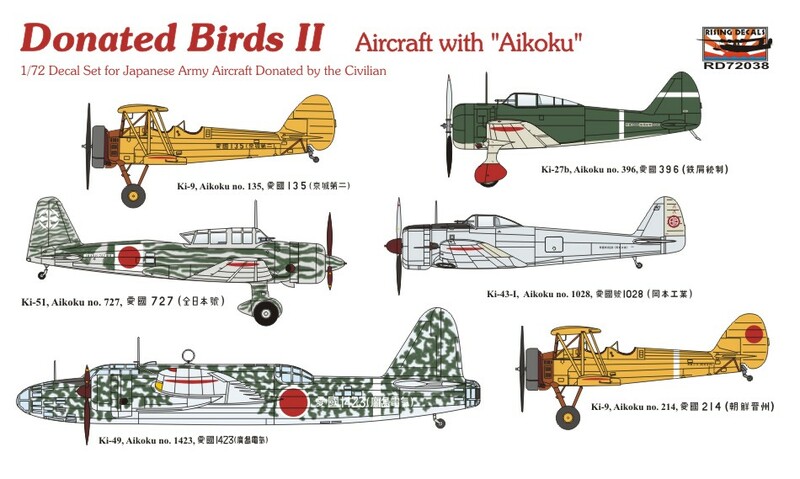 The Hayabusa contingent on this set is completed by three 64th Sentai examples, a Ki-43-I flown by 2nd Chutai leader and well-known ace Lt Saburo Nakamura, an early model Ki-43-II flown by 3rd Chutai leader Capt Yasuhiko Kuroe, another famous ace, and a Burmese presentation Ki-43-II Kai of the 3rd Chutai. 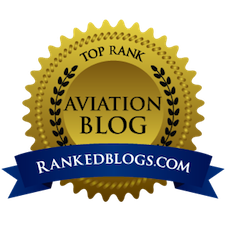 The latter has the best rendering of the distinctive peacock tail emblem that I have seen in this scale. 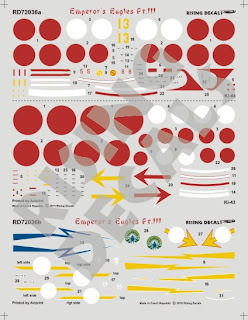 These decals are evocatively representative of two famous and long serving Burma-based Hayabusa units but still manage to offer unique and/or never before depicted schemes. For an out of the box Ki-43-II Kai only the AML kit is suitable but modification of the Special Hobby Ki-43-III Ko is probably feasible too. 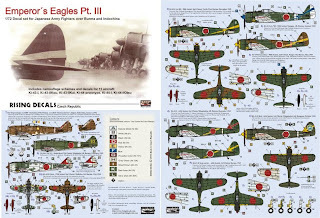 For the early Ki-43-II although the classic Hasegawa kit includes parts for an early production model the wingspan is correct only for later production models and cross-kitting is not as straightforward as it might seem. 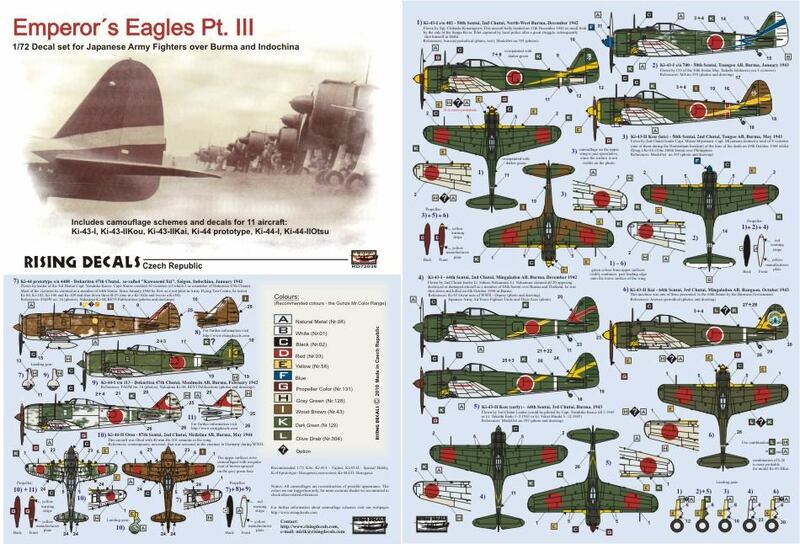 Finally the sheet includes three Ki-44 examples, an early 47th Independent Air Squadron aircraft flown by Capt Kuroe and painted earth brown, one of the initial production Ki-44 reinforcement aircraft for this unit painted dark olive green and a 40mm armed Ki-44-II Otsu of the 87th Sentai in Burma during May 1944. These are all good choices for the Burma and Indo-China theme and allow two different arcraft flown by the same ace to be modelled. 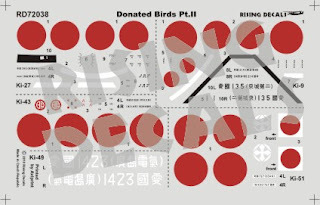 There are sufficient Hinomaru for two Ki-43 and two Ki-44 to be modelled but to use all the markings options Hinomaru from the kits or other aftermarket sheets will need to be obtained. Rising Decals 72038 Donated Birds II presents a selection of JAAF 'Aikoku' (patriotism) aircraft bought by public and private subscription. First up are two Korean donated Ki-9 biplane trainers for which the excellent RS models kit will be suitable. Then the classic Akeno Flying School Ki-43-I 'Aikoku 1028', a simple but very attractive scheme which was featured on early LS boxart (without the decals though!). I'm especially pleased to see this option and plan to "waste" it on the LS kit with a replacement Rob Taurus canopy. The 10th Independent Air Squadron's Ki-27 'Aikoku 396' is representative of the attack on Hong Kong and the details were provided by yours truly. The aircraft's appearance is based on a photograph, sketch and description by the pilot. 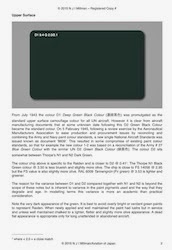 The 'Aikoku' legend was masked when the aircraft was painted deep green and remained visible on the original grey-green paint. This will have to be replicated on the model requiring a careful dimensional measurement of the decal and a thin strip of masking tape to the correct size. Probably a better option than trying to print the grey-green on the decal. 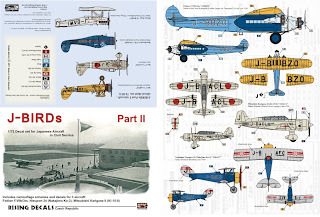 The fourth option in this set is a Ki-49 with very large 'Aikoku 1423 presentation in white. Finally a Ki-51 'Aikoku 727' of the Hokota Army Flying School in 'wiggly streak' camouflage with a white rectangle behind the fuselage Hinomaru. Another excellent and interesting selection of markings for Japanese aircraft models. 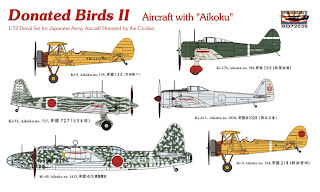 Hinomaru are provided for all the aircraft except the Ki-49 and there is only one set for the Ki-9. 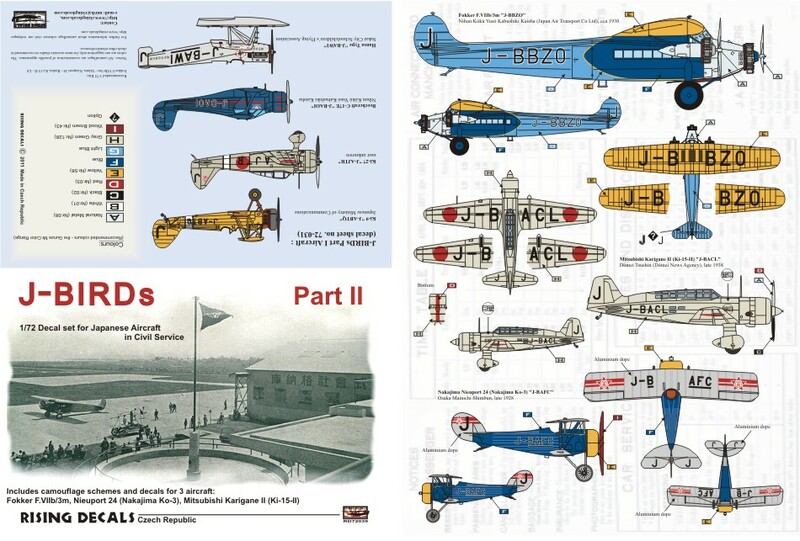 The last set is another selection of colourful Japanese civil aircraft in Rising Decals RD72039 J-Birds Part II. Star of this sheet is a Japan Air Transport Co Ltd Fokker F.VIIb/3m J-BBZO in two shades of blue and yellow. Some tricky masking and painting required but the final result would be worth the effort. Although the Valom kit is recommended the Frog/Novo classic is still obtainable and was also recently re-issued by Zvezda. Second choice is a Mitsubishi Karigane II (civil Ki-15-II Babs) J-BACL of the Domei News Agency. A simple scheme but an attractive alternative to the better known 'Kamikaze' record breaker and with the later more streamlined engine. Something simple for the weekend if you have the LS kit or Arii re-issue. Finally a very colourful Nakajima-built Ko-3 (Nieuport 24) J-BAFC of the Osaka Mainichi Shimbun. 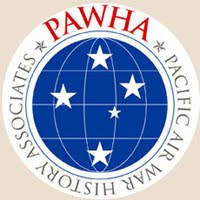 This will make a splendid little model in blue, yellow and aluminium dope with white outlined registration and star logo wing and tail markings. 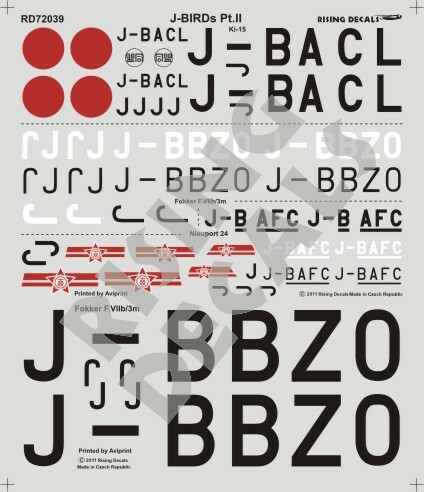 Rising Decals are to be congratulated on these sheets and for continuing to provide modellers with excellent, high quality alternative markings to the kit decals - which are often an unknown quantity. 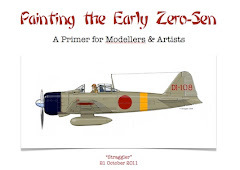 All of the instructions are in colour and follow the usual Rising practice of highlighting unknowns for the modeller to make his or her own choices. Thanks to Mirek of Rising Decals for very kindly providing the review samples. 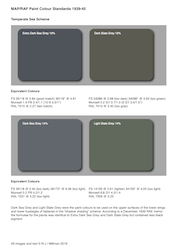 Thanks for the review and commentary on Rising's latest decal sheet offerings. 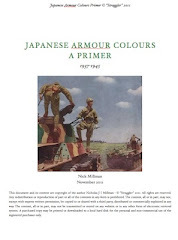 I hope you can persuaded Mirik to provide more IJA subject decals in the future from your data base.